In a lengthy and wide-ranging cover story, Bloomberg reports Apple is a much different place from the days when Jobs roamed the halls, but necessarily so as the previous compartmentalization of product groups doesn't jibe with Cook's management style. Since Jobs passed away in 2011, pundits have been quick to point out discrepancies seen in Cook's handling of the company. This is by design, however, as the publication cites former employees as saying there were concerns that a decentralized Apple would not work without a strong central leader. To make the system whole, Cook consolidated divisions to streamline operations and keep infighting down to a minimum, a tactic that ultimately led to former iOS chief Scott Forstall's dismissal. The internal shakeups were at one time taken as a sign that things were not going well in Cupertino, but continuing record sales, a near doubling of employees and successful new device launches appear to indicate a thriving business. Despite the changes, Cook is the first to point out that Jobs' ideals are still alive at Apple. Still, critics have claimed the company has lost its knack for innovating in a highly competitive and rapidly changing industry. As evidence that Apple is still a font of new ideas, Cook pointed to last week's iPhone event, where the company introduced a 4.7-inch iPhone 6, 5.5-inch iPhone 6 Plus, the upcoming Apple Watch and Apple Pay, the firm's first foray into mobile payments. 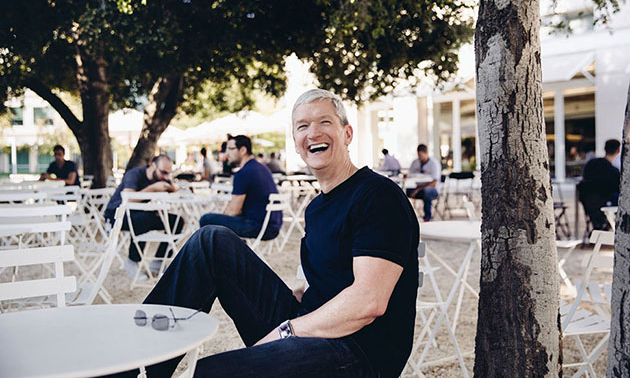 "Anybody coming out of there yesterday knows that innovation is alive and well in Cupertino," Cook said of the event. "If there were any doubts, I think that they should be put to bed." The article goes on to detail SVP of Design Jony Ive's work on Apple Watch, which entailed a deep study of watchmaking history, as well as Apple's workplace diversity, among other topics. A number of Apple executives contributed to the story, including SVP of Internet Software and Services Eddy Cue, who said, "I feel damn proud to be working as a part of Tim's team. If he gets a little bit of recognition from the outside world, that is great. He deserves a lot more than he is going to get."